I call Will Bishop at Yachting Partners International for more details of his latest joint central agency, with Hoek Brokerage, the new build 44m sailing yacht Lionheart and Will says that she's scheduled to hit the water in May 2010, with delivery in June or July. 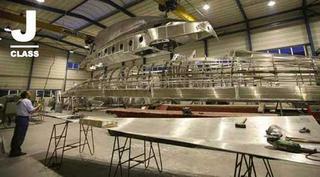 Lionheart is the first of a new breed of aluminium J-Class yachts being built to a Hoek design at Holland's Claasen Jachtbouw. When completed she'll be the largest J-Class superyacht in existence, with 17m overhangs on an LOA of 44m. Accommodating eight guests in four cabins, she's asking €14.9 million.